Hmm, what an interesting book this one proved to be! I’ve never read a book so jam-packed with word play and creative use of language as this one. I would describe it as a kind of literary vaudeville; a mesmirising act of vocabulary, idioms, metaphors, puns and similes. And, if that’s not enough, it’s narrated by a 500-year-old parrot with a penchant for jokes and scathing one-liners. Yes, really. 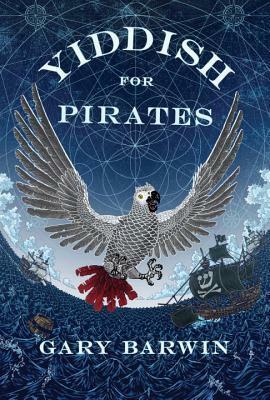 The story is essentially a boy’s own adventure set during the Spanish Inquisition involving the aforementioned parrot — an African Grey called Aaron — and a Jewish man called Moishe, whose shoulder he perches on. Fleeing persecution, this “odd couple” is helped in part by an underground network of Jewish sympathisers as they endeavour to save a rare library of important Jewish texts. Along the way they fall in with Christopher Columbus and set sail for the New World. Their journey is ripe with adventure, piracy, danger, violence and revenge. Unfortunately, I had some issues with this book. Too clever, too knowing, just too much creativity going on, basically.